Marathi Language.Reservation is applicable for women and handicapped persons as per rules. Interested candidates can send the full Bio-data on plain paper. 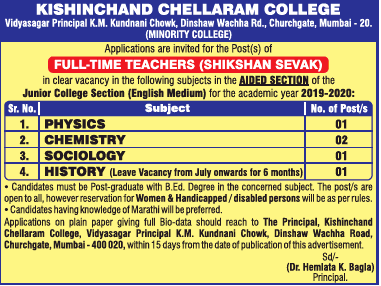 Refer the Official website https://www.kccollege.edu.in/contact-us-kc.php for more details of Kishinchand Chellaram College Teachers jobs. Available Teachers vacancy, Salary, Email-id, Important dates, Application Procedure, Qualification are maintained below. Ending Date to apply: with in 15 Days given from the advertisement. Interested and eligible candidates send the application on plain paper giving full details with all copies of Educational certificates and recent passport size photo to the college address.